On P.T. days , white pinafore and white shirt will be worn with white socks and white canvas shoes. In winter, Maroon Blazer with School Monogram are compulsory for students of Class VI - VIII. On P.T. days, white divided skirt and maroon T-shirt with School monogram will be worn with white socks and white canvas shoes. In winter, Maroon Blazer with School Monogram are compulsory for students of Class IX - XII. 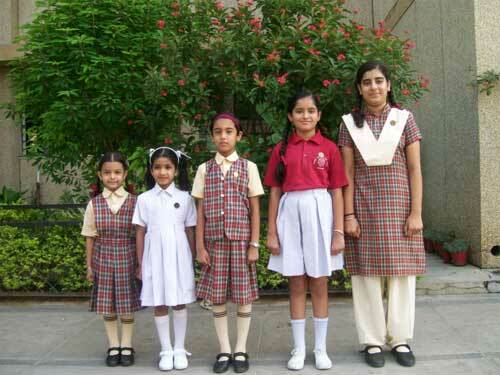 Checked Pinafore/Skirt/Jacket/Kurta/Salwar should be of prescribed pattern and colour. Hair should be neatly plaited and tied with maroon ribbons and for short hair maroon hair bands should be used. For students of Class I- XI, House Badges are compulsory. Class XI & XII students opting for Physical Education as the optional subject must wear the prescribed track suit with white canvas shoes only on practical days. It is compulsory to wear cycling shorts for students of Class I- VIII. For Sports Activities, students should bring their sports dress and shoes which can be changed when required. Participants should come to the school in proper school uniform.